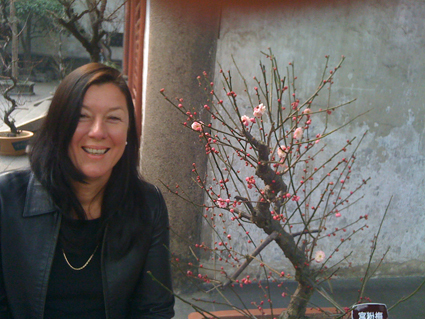 Kim Machan had to be even more resilient than her usual indefatigable self when she was informed late in 2013 that MAAP-Media Art Asia Pacific, the organisation of which she is director, was not to receive triennial funding from the Queensland Government for 2014-16. I spoke with Machan about managing this crisis and about her latest international exhibition, LandSeaSky. MAAP was one of a number of companies (especially in youth arts) inexplicably denied funding. Deeply upset, but committed to exhibitions to be mounted in Korea and China and then Australia across 2014, Machan had no choice but to push ahead. Ironically, says Machan, the Arts Queensland rejection came a few months after MAAP was announced the winner in the Visual Art category of the inaugural federal government Australian Arts in Asia Awards and the only winner from Queensland. The award was for MAAP’s Light from Light exhibition which focused on ideas around the properties of light, touring five major libraries and art museums in Shanghai, Beijing, Hangzhou and Brisbane 2010-12. For the show, Melbourne artists Janet Burchill and Jennifer McCamley created a solar-powered geodesic dome, installed as a temporary public artwork at each library site. Machan tells me she has had to drop 2014 programming at her MAAP SPACE gallery in Brisbane (it will be available for artist use in the short-term), lose her sole staff member and cease operating Mediabank, a generous equipment-lending scheme—some of that equipment will now go to Korea for use in the Seoul leg of MAAP’s LandSeaSky touring exhibition. A major exhibition, LandSeaSky—Revisiting Spatiality in Video Art will feature some 20 international contemporary artists at the Artsonje Center in Seoul, OCT-Contemporary Art Terminal, Shanghai and MAAP SPACE and Griffith University Art Gallery in Brisbane. Machan writes that in the exhibition “some of the world’s sharpest contemporary artists use the horizon line to explore some of the most fundamental and complex themes in both art and our perception of the world” (website). Central to the exhibition, says Machan, is the influence of Dutch conceptual artist Jan Dibbets’ Perspective Corrections (1968) which, she writes in her program notes, “transformed the way we think about photography as an art medium…He produced many short films in the Horizon series from 1970 and 1971 and continued his investigations in his 2007 photographic series Land And Sea Horizons. As a starting point, these works use a very common understanding of landscape—a straight line across a page to signify the change of land to sky or sea to sky—and go on to transform this representation into an extended investigation of spatial effects and perspectives. It is this premise, an investigation into the commonality and simplicity of the horizon motif, that is the launch point of the LandSeaSky exhibition” (website).1970s video artworks by Dibbets will be juxtaposed with new works made by other artists for the exhibition. For Machan the staging of the exhibition in three very different locations has been a fascinating challenge. In Korea Dibbets’ works will be on show at a major museum, the Artsonje Center. The other works, she says, will appear in five art museums and commercial galleries in walking distance from Artsonje, all in the Samcheong-dong district. In China, LandSeaSky will be shown on one floor of the OCT-OCAT Contemporary Art Terminal, Shanghai, the museum supplying all the necessary equipment. In Brisbane the show will be staged at Griffith University Art Gallery and MAAP SPACE. Of the 20 artists, five are Australian: Paul Bai, Lauren Brincat, Barbara Campbell, Derek Kreckler and Craig Walsh. The others are Jan Dibbets (Netherlands), Wang Gongxin (China), Zhu Jia (China), Yeondoo Jung (South Korea), Giovanni Ozzola (Italy), Joao Vasco Paiva (Portugal/Hong Kong), Wang Peng (China), Kimsooja (South Korea), Sim Cheol Woong (South Korea) and Heimo Zobernig (Austria). Supporters of the exhibition include the Australia Council, the Australia-Korea Foundation, Queensland University of Technology and the QUT Confucius Institute. Previous works by some of these artists suggest their preoccupations are a perfect fit for the exhibition’s theme: Paul Bai’s video installations Other Side of the Horizon (2010), Heaven (2010), Horizon 1 (2008) and The Sky is the Limit (2008), and Joao Vasco Paiva’s transformation of ocean waves or ‘negative spaces’—eg the sky between buildings—into data that becomes music and visual abstractions. Extant works which also match the theme are in the exhibition: Lauren Brincat’s performative video This Time Tomorrow, Tempelhof (2011) and Giovanni Ozzola’s Garage—Sometimes You Can See Much More in which a rattling roller door opens onto an ocean view (2009-11). I had the pleasure of attending a preview, with a small audience, of Barbara Campbell’s close, close. Her 1001 Nights Cast (2005-08; RT86), a durational online engagement with hundreds of participants who volunteered stories in response to the artist’s prompts, was her first work using digital means. For LandSeaSky, Campbell has created an interactive video work, “following the journey of migratory shorebirds on the East-Asian-Australasian flyway,” from Siberia to “feeding and resting sites on the Korean Peninsula and China’s east coast.” Our lives relate to bird migration in significant ways often little or not at all understood. Campbell wonders “How close can we come to another species…when it disappears from our horizon?” This subtext to the work was partly inspired by a recent residency in China. Filming and sound for the work is by Gary Warner and the responsive programming by John Tonkin, whose immersive Experiments in Proximity, at Breenspace, June-July 2013, surprised viewers who discovered that as they moved towards or sideways to a screen its video imagery seemed to be in their control, that the point of view was theirs, whether following a swimmer underwater or two men conversing in a supermarket (see RT105). 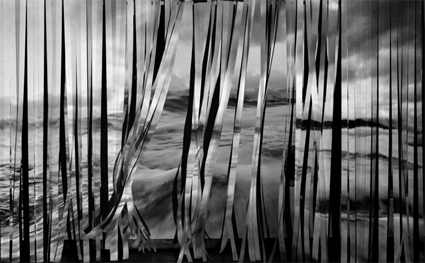 In the preview of close, close, viewers wander into a narrow, darkened space to face a distant wall onto which is projected, in a wide, very narrow strip, a landscape. The strip is either still or moves slowly up or down variously revealing flowing water, sand and thin foliage, the tops of passing boats and open sky. On the sand, and taking flight, are large numbers of ‘waders’: Bar-tailed Godwits, Sandpipers of various kinds and Red-necked Stints. Filmed recently in Moreton Bay, these shorebirds of the East Asian-Australasian Flyway will migrate north in late March-April. The selective point of view—tautly framed images of slices of a living coast-scape—is entrancingly contemplative. Then you realise it’s your movement, or that of others around you, forward or back, that is making the selection and its seamless shifts between different horizons. The shifts in the soundtrack, using a discretely recorded water track and the sound of a bamboo whistle used to attract birds for banding in China, add other dimensions to the notion of horizon—aural and ecological. These glimpses of LandSeaSky’s horizons suggest it will be an expansive exhibition at once thoughtful and playful. In the time between the announcement of MAAP’s funding bad news and now, Kim Machan seems buoyant, ready to go, to once again bring together Australian, Asian and fellow international artists in a major exhibition. Check out the media art archive for all previous articles on MAAP.